The Police Officers Memorial and the annual Remembrance Ceremony honor the memory and sacrifice of police officers from around New York State who have been slain in the line of duty. It is located at the Empire State Plaza near the State Capitol Building in the City of Albany, NY. The Memorial was designed by the New York State Office of General Services based on a design concept submitted by Colleen Dillon Bergman, daughter of State Trooper Emerson J. Dillon Jr. who was slain in the line of duty in 1974 after 16 ½ years of service with the New York State Police. A quote from Mrs. Bergman's letter is engraved on the nameplate wall: "It doesn't matter from which department they came, the feeling of loss is experienced the same." The names of 1,567 officers are engraved on the Memorial wall. Among them are the names of 910 officers from the New York City Police Department. The remaining 657 officers are from 146 police agencies statewide and 6 federal agencies. Names are placed randomly on the wall and without rank. 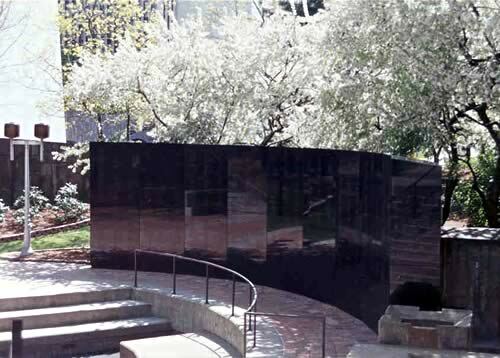 The Memorial wall is polished black granite and divided into twenty-two panels lettered (A - V). The identifying letter is located at the base of each panel and reads from right to left. Each panel is divided in half and each half is identified as either top or bottom. To find the name of a fallen officer, locate the officer's name in the Roll of Honor (PDF), and then read to the far right to determine the panel and whether the entry appears on the top or bottom half. A Remembrance Ceremony is held at the Memorial each year during the month of May. For more information, please select from the Local Menu options.